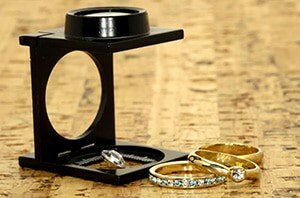 One question we are often asked is whether we do appraisals on your jewelry. What we do is a little different from most jewelry stores. First-of-all, our services are always completely free of charge, where a typical jewelry store might charge $50-$100 for a single appraisal. The reason for this is a jewelry store appraisal of your items will typically be for the purposes of establishing a replacement cost for your insurance company. As insurance companies will only pay a percentage of this amount if you made a claim, the appraisal from the jewelry store is usually even higher than what you would pay at the store (think of it as an item’s regular price, and the price you pay is usually some “sale” price that is 30%-70% less than that). A jewelry store would never purchase your item from you for the appraised amount (remember, it’s more than what you would pay them for it and used partly as a sales tool). What we do is called a material evaluation, or an appraisal of your item’s value based on its precious metal content, and the value of any diamonds. Because our evaluations are based on the market value, we are happy to purchase your items for this amount on the spot. If you wish to keep the item, that’s no problem, there is never any obligation to sell. But keep in mind, our prices are based on the current gold price, and they are subject to change from day-to-day. To sum it up, an appraisal is given by a jeweler and is only used to determine the amount your insurance company might pay in the event of a loss. Our evaluations are based on the current gold price (the “melt” value), and while they are almost always much lower than the insurance appraisal, the difference is that they are an actual offer to purchase your items.